How do you like your Sparks? If it's the latter, be sure to join us again tomorrow for third free practice and qualifying. We're live on these here pages from 12:30 BST. Andrew Benson's FP2 report is now live. We'll also keep you up to speed on any possible punishments for Hamilton or Raikkonen. Bye for now, and thanks for your company today. Here's the moment Lewis Hamilton jumped the queue at the end of the red flag period. Kimi Raikkonen had done likewise just moments earlier. "That kept us on the seats of our toes," says Eddie Jordan in summing up second practice. So, even though he finished that session in the pits it is Nico Rosberg who ends FP2 on top with a best time of 1:34.647. Team-mate Lewis Hamilton is second just a tenth back, with the Ferraris of Kimi Raikkonen and Sebastian Vettel third and fourth, half a second in arrears. The rest of the top 10 is completed by Bottas, Ricciardo, Maldonado, Nasr, Kvyat and Massa. Lewis Hamilton is under investigation for "failing to leave pit lane correctly" after that red-flag period. Kimi Raikkonen will also be investigated for the same offence. Replays show both men took a few liberties exiting the pit lane, passing stationary cars ahead. Rosberg leads but he's in pits. Engineer to Nico Rosberg: Nico, box, box, box, we see something we don't like on the telemetry. Lewis Hamilton among the cars heading straight out. What can the Mercedes man do in the last five minutes? The stewards' office has confirmed it will investigate that tangle between Vettel and Perez at the end of FP2. Sebastian Vettel: "I had a failure - a brake failure - and then Perez took my wing off. Unbelivable." The German reports a braking problem having just left the pits, and as he limps into the first turn the Force India of Sergio Perez sweeps across him, damaging his front wing and leaving debris on track. Prathap Krishnan: The one I miss most from recent times is Alonso and Webber. Good, hard, clean racing... highly understated too. Ross Arnold: Schumacher and Hakkinen for me, great drivers, great rivalry, great respect. Sam Leaver: It HAS to be Senna v Prost. Out-and-out class v political mastermind. No, not a hip-hop act, but rather a solution which help teams track the behaviour of airflow across a car's bodywork. It's normally used in pre-season. The fact it's smeared on the McLaren at the fourth race of the campaign perhaps gives some indication of the trouble the team is in. As Mercedes have indicated below, long runs are very much the order at the moment - both on the soft and medium tyre. The soft tyre is proving substantially quicker than the medium in the Bahrain heat and the teams will want to spend as much time as possible on the softer rubber come Sunday. Tyre management the key to victory? Where have we heard that before? 1. Rosberg, 2. Hamilton, 3. Raikkonen, 4. Vettel, 5. Bottas, 6. Ricciardo, 7. Maldonado, 8. Nasr, 9. Kvyat, 10. Massa. That random Star Wars reference of a few moments ago reminds me of an amusing tweet doing the rounds today, in which some wag has taken a still from the new Force Unleashed film and mashed it up with our favourite Venezuelan F1 pilot. Lewis Hamilton: "Rears are sliding around." "Poor Jenson Button. (McLaren) noticed an anomaly in the engine data so they asked him to stop the car. At least they could be proactive in the stoppage, whereas this morning the engine just cut out." Happy to report that Button's car is fixed again and he's just completed a quick recce lap. In the words of Han Solo: "Baby, hold together." Williams on Twitter: Just because Frank's turned 73 doesn't mean he's out of touch! Sir Frank celebrated his birthday on Thursday. Truly one of F1's legendary figures. Manor F1 on Twitter: Will I am sets sail on Yellow rubber. That's soft tyres to you and me. Will Stevens is currently 18th, 4.4secs off the ultimate pace. The team is well on target to be inside 107% of pole in qualifying. Both Lotus drivers have been a bit lairy in this session, but there's pace in that car. Pastor Maldonado has done an impressive lap just 0.8s off the best time of Nico Rosberg - and within two tenths of the Williams of Valtteri Bottas and the Ferrari of Sebastian Vettel. Don't forget we have extra camera streams available across all sessions this weekend, including Pitlane feed, Driver tracker, On board, Timings screen and alternative commentary. With their initial soft-tyre runs done it's no surprise to report the Mercedes are now top of the order. Nico Rosberg has the benchmark time with a 1:34.647. Team-mate Lewis Hamilton is second, just over a tenth back. Next up is the two Ferraris - half a second further back on the same tyre - followed by the Saubers of Felipe Nasr and Marcus Ericsson. "For Force India drivers Nico Hulkenberg and Sergio Perez, the start of this season has been a struggle, and there is no quick end in sight. The team, already on the back foot after introducing their new car with only two days of testing before the start of the season, delivered the bad news last month that a major upgrade package due initially for the next race in Spain will not now appear until Austria in late June at the earliest. "Not good news for a team already struggling to stay ahead of the McLaren-Hondas - which will surely improve much more quickly - at the back, with only Manor behind. "It's all quite a change from 12 months ago, when Perez finished on the podium in Bahrain. The Mexican admitted there was no hope of a repeat of that, but he did say the team could realistically hope to score some points." Sam Payne: No rivalry better than Schumi and Hakkinen. Especially in 1998 and 2000. That overtake at spa still the best ever. Martin Jones: World champion Alan Jones and Williams teammate Carlos Reutemann were hardly besties in the early 80s! No love lost there! Ryan Nurse: Bit of an unconventional one: Perry McCarthy vs. Andrea Sassetti, whose team he drove for in '92. The guy HATED him. Sebastian Vettel: "It was a good lap until the last corner - I messed up." Right, times are coming down now after Ferrari bolted on the quicker soft tyres. The current order is Raikkonen, Vettel, Ericsson, Hamilton, Hulkenberg. Lotus on Twitter: Hello birthday boy! Pastor Maldonado has just run wide through the final corner. Rich Atkinson: F1 was so much sexier in the '70s! J: I'm supposed to be working! Nico Rosberg: "I need to change the brightness on my... oh wait I'll do it myself." Monitor problems for Rosberg. How Button would kill for something as trifling right now. More woe for JB. His McLaren has ground to a halt - just as it did in FP1! He looks like a seriously unhappy camper as he extracts himself from the car, which rolls backwards away from him in one final act of petulance. After a low-key session this morning, Lewis Hamilton has taken the Mercedes to the top of the order early in FP2. A lap of 1:36.759 has him one tenth clear of Sebastian Vettel's Ferrari. He's just overcooked it into turn one, running well off track, but he recovers and continues. Good news for Jenson Button. A battery problem has kept him sidelined since the opening minutes of FP1 and a lengthy repair job has just been completed by the boys and girls at McLaren. As BBC pit lane reporter Tom Clarkson rightly points out, if Button had to choose a session to miss this season, it would have been FP1 in Bahrain - 90 minutes of track time that bear absolutely no relevance, temperature-wise, to what will play out in the race. Doesn't get much closer than that. 0.001secs between Massa and Bottas on their first laps in P2. Honda Racing F1 on Twitter: In the garage the McLaren-Honda engineers are working on Jenson Button's car ahead of FP2. Button's car lost power less than two laps into FP1, pitching the Briton into a spin. 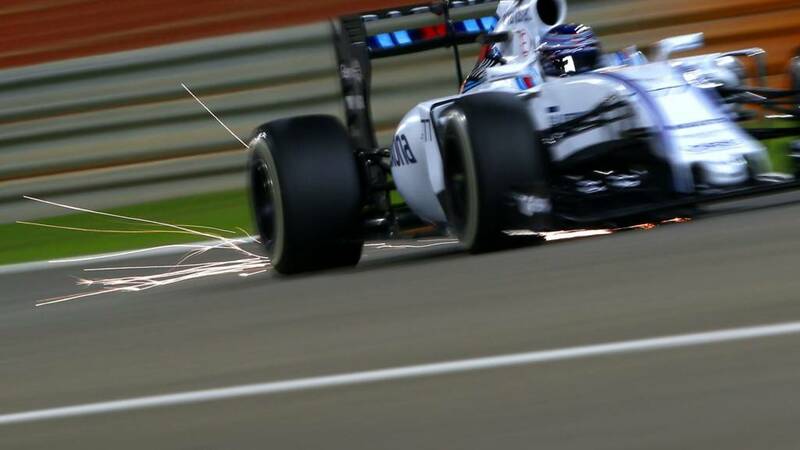 Ooooh, Felipe Massa's Williams has just thrown up some lovely sparks from its titanium skidblock as he charged down the pit straight. This session under lights should be very easy on the eye. The lights are on at the Bahrain International Circuit, the temperature is dropping, and we're off and running in FP2. Time to show your hand, Mercedes. Over on F1 Rewind, Lewis Hamilton has just won the 2008 title in dramatic last-gasp fashion. Still can't help but feel for this guy. He drove quite brilliantly all year. Just in case you're wondering how much of Sunday's race will be run in the dark, the answer is pretty much all of it. The race is due off at 18:00 local time (16:00 BST) - just three minutes before sunset. "Mercedes drivers Nico Rosberg and Lewis Hamilton were only 15th and 16th in first practice but there was nothing to be alarmed about. "The team decided that, because the daytime temperatures were so unrepresentative of what will be experienced in post-dusk qualifying and race, they would treat it as a test session. "Much of their work was devoted to parts for future races. This second session should see a true reflection of Mercedes' competitiveness." Here's two famous F1 rivalries rolled into one picture. When this picture was taken in 1986, Ayrton Senna and Alain Prost on the left were still merely future McLaren team-mates, their intense rivalry - which has since become woven into the very fabric of the sport - still to take root. Seated on the right, however, were two men already in a full-blown conflict. Nigel Mansell and Nelson Piquet really did have a hate-hate relationship at Williams. Their bickering would allow Prost to nick in and steal the title from under their noses come the '86 season finale in Adelaide. Piquet would take the title in '87 but only after a titanic struggle with Mansell that finally did for their already fractured relationship. ...but if you love your F1 nostalgia you really need to check out our F1 Rewind programme, which today looks at famous title deciders. It's on BBC Two right now or you can navigate to it using the tabs above. Suzi Perry and Murray Walker have already taken a look back at the 1976 title decider and are now casting an eye over 1986. They conclude with 2008. It's time for us to sign off for a couple of hours at the end of a session that leaves us no nearer to knowing what the order will be this weekend. That said, it's hard to see beyond a Mercedes one-two come qualifying tomorrow, even with their sandbagging in FP1. Expect to see an awful lot more from the Silver Arrows later this afternoon. The question is, will Ferrari be able respond? McLaren also continue to intrigue. The car's pace in the hands of Fernando Alonso looked reasonable in that session, but a problem for Jenson Button after just two laps has created yet more headaches for the team. What will happen in FP2? Join us from 15:30 BST to find out. F1 Rewind on BBC Two at 15:00 BST, where the subject will be famous title deciders of the past. Read Andrew Benson's FP1 report. Ok, that practice session didn't quite play out as other have done this season, with the two Ferraris at the head of the pack. The Mercedes are playing the long game, clearly working on set-up work, and their two drivers are way, way down the order. Given Sunday is a night race, they will almost certainly show their hand in FP2, when it will be cooler. Some semblance of order has been restored to the top of the timesheets with Ferrari now sitting one and two, Raikkonen leading the way with a time two tenths up on team-mate Sebastian Vettel. Jolyon Palmer has impressed again today. Although he's down in 14th at present, he is again just half a second down on regular Lotus driver Pastor Maldonado. He's also completed more laps than any other driver in this session. The Mercedes of Lewis Hamilton and Nico Rosberg are 13th and 14th at the moment. Frank Hardee: "I'm Jolyon Palmer's former A level politics teacher - so rooting for him on the last day of my Easter break in a Thailand bar! Good to hear former F1 driver and BBC commentator Jonathan Palmer having a chat with Lee McKenzie on BBC TV just now. There's something in his well-spoken delivery that transports me back to the mid-1990s, when as a teenage F1 fan I would sit and avidly watch races from start to finish - and then within a couple of hours watch them all over again on VHS. James Constable: Villeneuve and Pironi has to be on the list. Relatively short-lived, but ultimately fatal. David Dawson: My recent favourite was the battle between Caterham, Marussia and Hispana to be the first points scoring 2010 team. Mihail Nesterovich: How about two F1 champs on North American soil - Andretti vs Mansell! If you said Pastor Maldonado, give yourself a pat on the head and a biscuit. In fairness to the Lotus driver, he's just one of many drivers to test the limits today. It's what practice is for, right? this feature on the wild Venezuelan is well worth a read. So Fernando Alonso's spell at the summit was short-lived. The Toro Rosso of Max Verstappen is now top of the pile, followed by Alonso and Force India's Sergio Perez. BBC commentator Ben Edwards describes the standings at present as "utterly irrelevant". Right. McLaren have just gone quickest. Proof, 'twere it needed, that this session hasn't quite hit its straps yet. While it's gone a bit quiet now would be a good time to wish happy birthday to former Shadow, Arrows, Brabham, Alfa Romeo, Williams and Benetton driver Riccardo Patrese, who turns 61 today. Patrese won six grands prix in a 256-race career between 1977 and 1993. For many years he held the record for most F1 starts before he was usurped by Rubens Barrichello, who went on to make a mighty 322 race starts. Lotus driver Romain Grosjean is also celebrating. The Frenchman is 29 today. Peter Wanyonyi: Senna and Prost always had a rather sinister element to it. Lewis-Nico pales in comparison. Lewis has Nico totally beat. Mike Hawkins: How about Jenson Button and reliability. Emma Harness: Have to mention Sebastian Vettel and Mark Webber!? Some very awkward moments there. It's all gone rather quiet on track. The only cars pounding around at present are the Mercedes. Ah, wait a moment - Jolyon Palmer has just joined them... and a Force India. "One of the stars of China - indeed of the season so far - was Toro Rosso driver Max Verstappen. The Dutchman pulled off some stunning overtaking moves and in general looked like an experienced campaigner, not the callow 17-year-old he is. "Verstappen, already very adept on the track, is still finding his feet in public appearances and does not say a great deal, and he was refreshingly straightforward about his weekend. 'Well, first of all, I was really enjoying my race,' he said. "It is no exaggeration to say that everyone in F1 is watching to see what this rising star can achieve this year." Just another call for your F1 rivalries. There's obviously one famous one that all F1 fans know about (clue: it rhymes with Penna and Srost) so try and give us some more from F1's annals. I like Hill-Schumacher from the mid-1990s. Plenty of thrills, spills and needle. Not least at Silverstone '95 (below). "Sebastian Vettel is under no illusions that his Ferrari has suddenly become the equal of a Mercedes just because he won a race in specific circumstances in Malaysia and managed to stay in touch for a while in related ones in China last weekend. "'They are still in front,' Vettel said. 'Hopefully we can close the gap some time soon.' The fact that this race takes place after sunset should in theory take some of the heat - literally - out of Mercedes' tyres and make things more comfortable for them. But Vettel still has his hopes. "There's only one team in front, of course." We're approaching the half-hour mark in this opening session and top spot at present is in the possession of Ferrari's Kimi Raikkonen, who's done a best lap of 1:38.917. Team-mate Sebastian Vettel is second, two tenths back, with the Williams of Valtteri Bottas a fraction further back in third. Sebastian Vettel has a problem in the Ferrari, it seems. The German is going very slowly out there having just set a time good enough for second place behind team-mate Kimi Raikkonen. Just a reminder that we have four Britons in this session, with Lewis Hamilton, Jenson Button and Will Stevens joined again by Jolyon Palmer. Palmer made his F1 weekend debut for Lotus in FP1 in China and did not disappoint, setting a time just over half a second off regular driver Pastor Maldonado. The reigning GP2 champion again replaces Romain Grosjean in the Lotus for FP1 this weekend. "Button said the McLaren still lacks overall downforce as well as power but the news about the McLaren chassis is more encouraging than that. McLaren were 3.5 seconds off the pace in qualifying in China and the Honda engine was understood to be about 180bhp down on the Mercedes. "That power deficit equates to about 2.9secs of lap time, which means the McLaren chassis is about 0.6-0.7secs off the Mercedes. Or, to put it another way, about as good as a Ferrari. Given where the team were last year, that is reasonably encouraging, especially if the team's confidence about their ability to add downforce is justified." "McLaren drivers Fernando Alonso and Jenson Button are expecting another tough race in Bahrain. Both cars finished for the first time this year in China last weekend and the team have promised the drivers more power from the Honda engine, which is still lagging a long way behind all the others. "But Button said not to expect too much. 'It was a big deal for Honda to finish both cars,' he said, 'but I don't think you'll see a big step forward in terms of outright power here. It is a very difficult race for everyone because of long straights heat and wind, which brings a lot of sand, and it will be tricky circuit for us because of the long straights. The positive for us is we are pretty good at looking after rear tyres; whether that is enough to move forward I'm not sure.'" Just as in China a week ago, it's a very poor start to practice for McLaren. Jenson Button has just spun and stalled his car at the first turn. He's climbing out of the troublesome McLaren and he's done for the time being. At least it's a short walk back to the pits from there. Of course it's just under a week since his team-mate Fernando Alonso lasted just two laps of third practice in Shanghai before an engine failure halted his progress. Still real problems down at McLaren-Honda. First free practice is under way. The drivers are not hanging around. A queue of them are waiting to get out of the pit lane. Lewis Hamilton won a thrilling race-long battle with his Mercedes team-mate Nico Rosberg to win last year's Bahrain Grand Prix. Their fierce battle at the front became a 10-lap sprint after a late safety car period wiped out Hamilton's 10-second advantage following a crash for Sauber's Esteban Gutierrez. You can relive their fight for victory here. There's only F1 topic on our tongues this week… Lewis versus Nico. After their public spat in China, we want to know which are your all-time favourite F1 rivalries. Does the battle of the Mercedes boys match up to the likes of Senna versus Prost? Get involved by using the hashtag #F1rivalries on Twitter. "The build-up to this race has been all about Lewis Hamilton, one way or another. "Whether it be the controversy over Nico Rosberg's allegations that Hamilton was selfish and backed his Mercedes team-mate towards the Ferraris in China last Sunday, or the faintly ridiculous farrago over Hamilton's spraying of champagne on a podium hostess, the world champion has been at the centre of things. "Hamilton, though, is keen to stand apart from it all. He played both down on Thursday and says his mind is focused only on the job. He might have won in Bahrain last year, but for him it was an imperfect weekend - Rosberg was faster throughout. Hamilton wants to make amends by taking pole and dominating the race this time around." Just to remind you that this weekend's action is live on BBC television, as well as the usual service on radio and online. Video footage of FP1 and FP2 will be available today on this website using the tabs above, while you can also access the action using the Red Button. TV coverage is off at 11:55 BST. "A bone-dry weekend in store, as might be expected. Friday will prove the hottest day - into mid-30s C by FP1, with mid-high 20s into evening. Saturday and Sunday will see maximums come down a bit - around 29-30C, and again into mid 20s through the evenings. "The key issue will be the wind. This won't be a factor for Friday's sessions but will most certainly be a pain on Saturday. For FP3 and qualifying, it will be noticeably breezy with the attendant risk of sand and dust blowing on to the circuit and perhaps some dust haze issues evident too by qualifying. "Sunday will remain pretty windy through the first half of the day, but by race start this won't be as much a factor - still breezy, but not markedly so." Watch the full forecast here. Formula1.com on Twitter: 20 MINS TO GO until the start of #FP1. Here's the scene at @BAH_Int_Circuit - air temperature is 32C. "It's hot in Bahrain. That pretty much goes without saying. But whether the desert will have the same effect on compromising Mercedes' competitiveness as the tropics in Malaysia three weeks ago is another matter. "The fact the race happens after nightfall cools things down but the season is too young to draw definitive conclusions about what certain conditions might mean for the relative pace of Formula 1's two fastest teams. One thing does seem clear, though. Night or day, it is time for Mercedes v Ferrari round four." Hello and welcome to BBC Sport's live text commentary on the opening practice sessions for the Bahrain Grand Prix. The latest round of the 2015 season promises much, with Lewis Hamilton bidding to make it three wins out of four at the start of the season, Nico Rosberg under pressure to get to grips his Mercedes team-mate, and Ferrari seeking to prove that their Malaysia win was no flash in the pan. It feels like a key weekend. First practice is off at 12:00 BST. Throw an arm around a loved one and settle down. F1 has its faults. We all know that. 'Myriad' is the word that leaps easily to mind. But when it comes to putting on one hell of a spectacle, there's not a lot in the wide, wide world of sport that can top it. The picture above, taken yesterday evening in the Bahrain International Circuit paddock, is about as impressive and enticing as it gets. I say we go in.